Even the soggy parts of California saw less rain than Phoenix. 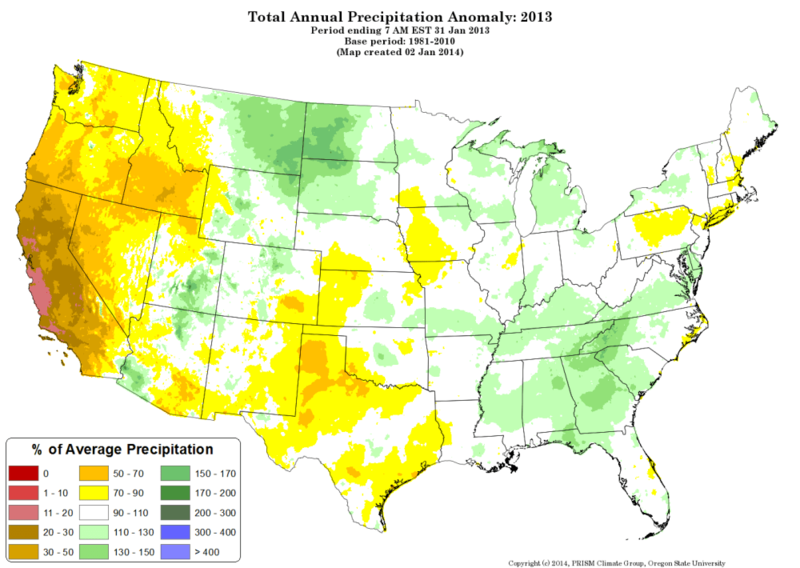 This map shows how far precipitation totals in 2013 deviated from the 30-year average. With its pinks and browns, much of California received only 11 to 30 percent of a normal year’s rainfall in 2013. Click image to enlarge. Not even Nigel Tufnel’s legendary amplifiers could match the intensity of California’s 2013 drought. The lead guitarist for fictional rock band Spinal Tap claimed to turn the volume to 11, but a year of unrelenting dryness has completely changed the way drought is perceived in the nation’s most populous state. What does that off-the-charts comparison mean? It means that 2013 was an unprecedented year by an unprecedented margin, so dry that it shattered a handful of previous records by 40 to 60 percent. For instance, average annual precipitation at San Francisco International Airport is 20.65 inches. The previous drought record was 9.22 inches in 1952. Last year, the rain gauge at the airport measured just 3.38 inches – similar to what was recorded in parts of the Mojave Desert in southern California and southern Nevada. For most of the year a large ridge of high pressure (a “brick wall,” said Johnson) has blocked storms from the Gulf of Alaska that usually dump rain on California. Computer models do not show the wall moving much in the next two weeks – and every day counts during the winter, a critical time for building the mountain snowpack. An extreme event trumping an extreme event by such an obscene amount is so unusual that it left Johnson, who has studied California weather for decades, struggling to find the right words or analogies to describe it. On New Year’s Eve, Johnson gathered data from dozens of individual weather stations in the state to put together an annual review. What he saw pumped him so full of adrenaline that he couldn’t go to sleep. “Every line I typed I couldn’t believe what I saw,” he said. That same sort of insomnia will befall many in California in 2014, but for less exhilarating reasons. There are clear reasons to worry about the state’s water supply. Last year was a second consecutive drought year. State officials anticipate a third. The first snow survey of the season found the Sierra Nevada snowpack just 20 percent of normal – “more bare ground than snow,” as the Department of Water Resources put it. Less snow means less runoff into reservoirs, which are already flagging. Storage in the reservoirs that supply the state’s two main canal systems is just 36 percent of capacity. Folsom Lake near Sacramento is less than 20 percent full, prompting water restrictions in the capital region starting in December, usually the wet season. The Bureau of Reclamation, which manages one of the canals, has told farmers to expect just 5 percent of a normal allocation. That preliminary figure, a conservative estimate, may rise but not by much. At the start, 2014 is not looking good for California water. Odds are, precipitation will not be as scarce as last year, but with supplies already diminished, the consequences of another dry year could be worse.